This is the story of Cujo - a friendly, 200 pound Saint Bernard that was bitten by a rabid bat. Cujo had not received any shots against rabies, so he immediately gets sick. 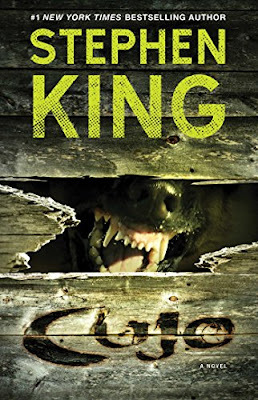 He is owned by a young boy, named Brett, who does not know Cujo is sick before leaving on a vacation with his mom. Another family - the Trentons - are in the same town. They have met Cujo when Brett's dad has worked on their car in his garage. Mrs. Trenton's car starts to give her trouble while her husband is away, and she and her young son go to have it fixed and come face to face with a now rabid Cujo. This book was not that great. I am a big Stephen King fan, but this one was just a bit....boring. It had intense sections - yes. But the in between banter between the characters seemed all over the place. It was hard to hold my interest. This one was just....eh. I don't recommend.